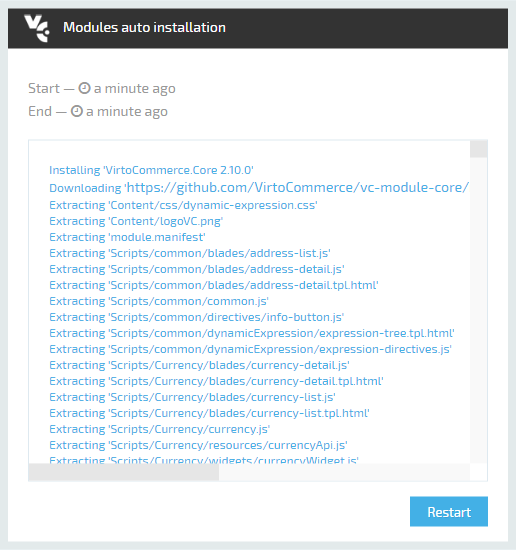 You can deploy the latest version of VirtoCommerce Platform to Azure with just a few clicks. Directory and Subscription options define which Azure subscription will be used. Resource group option allows you to create a new Azure resource group or select an existing one from the list. The new SQL server and the new website will be added to this group. Resource Group Name is the name of the new resource group. Site Name is the part of the new website URL: http://site-name.azurewebsites.net. By default, the site name is generated by adding 4 random characters to the Git repository name. Sql Server Name is the name of the new SQL server. Sql Administrator Login is the login for the new SQL server administrator. Non-alphanumeric characters such as: exclamation point (! ), dollar sign ($), number sign (#), or percent (%). Install Module Bundle option defines which modules to install automatically after deployment. If you select Commerce then all modules required for creating an eCommerce application will be installed. If you select None then no modules will be installed automatically and you will get the clean platform. Enter the password for SQL Server administrator and click Next button. 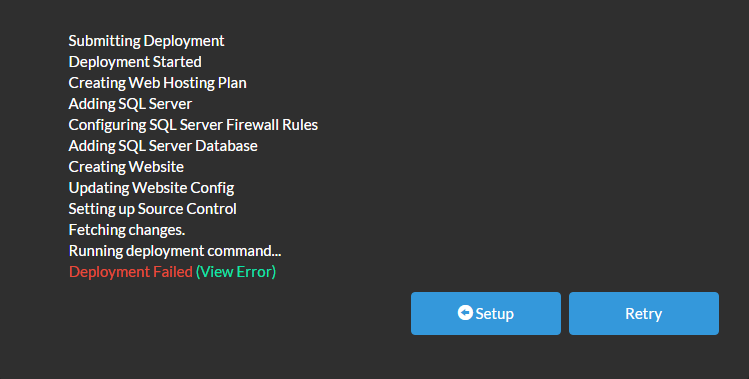 On the second page of the deployment wizard click Deploy button. The deployment process will take about 3 minutes. 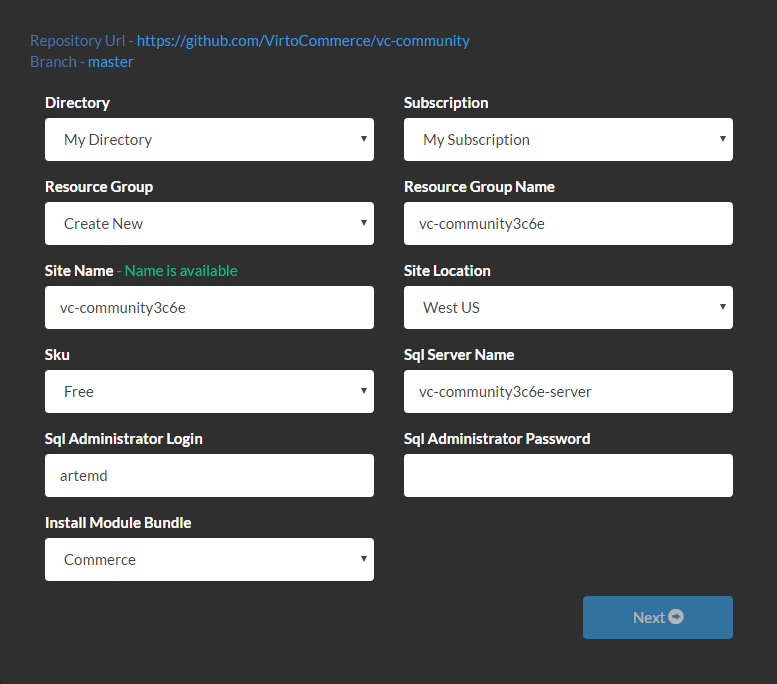 You can now browse to the VirtoCommerce Platform, the login is: admin, and password is store. Click Restart button to activate installed modules. Clicking the green (View Error) link will not explain anything, you should go to Azure Portal and check the deployment log. Open Web Apps and select your recenly created web app.Click on Active Deployment widget.In the Deployments list click on the failed deployment.In the Deployment Details click View Log.The most frequent error is related to downloading packages from NuGet. This is a temporary issue and in most cases clicking Redeploy in Deployment Details blade leads to successful deployment. Open Web App settings.Open Deployment source.Click Sync button in the toolbar. This operation will download the latest source code from GitHub repository, compile it, copy the result to the wwwroot directory and restart the web site.